Even as the news came in from Delhi that the Gujarat police has “opposed” anticipatory bail application in Supreme Court by top activists Teesta Setalvad and her husband Javed Anand, about two dozen prominent citizens of Gujarat have expressed their “profound dismay and disquiet” at the “continued official harassment” of human rights defender. The Gujarat police in its affidavit said its probe “supported” the evidence that the amount meant for “the rehabilitation and welfare of the unfortunate victims of riots in Gujarat in 2002” was spent on having dates, consumption of wine, whiskey and rum, purchase of movie CDs of Singham, Jodha Akbar and PAA, buy several pairs of spectacles, wining and dining at some of the best restaurants and fast food outlets of Mumbai. Pointing out that “bullying” has been going on ever since the BJP led government came to power in India in May 2014, it said, the effort is to “tarnish their reputations and secure their arrests”. 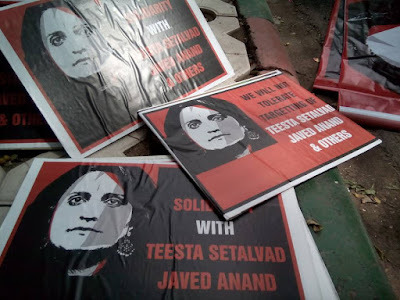 The statement reiterated how Setalvad and Anand have fought an “unrelenting battle” not only to bring to book criminals who committed gruesome hate crimes against Muslims in the carnage of 2002, but also to “expose” the role of the Gujarat government in enabling, abetting and even organizing these crimes. “They have been fearless in charging the then Chief Minister, Narendra Modi, who is currently the country’s Prime Minister, with direct criminal culpability for these crimes. For this, they have assisted the widow of a former MP, who was slaughtered in the carnage, Zakia Jafri, to fight a brave court battle”, it said. “What we are witnessing is crude and defiant misuse of official bodies to beat down these human rights defenders so as to silence their voices, break their morale and divert them from their unrelenting battles in defence of justice which charge the country’s current leadership with complicity in hate crimes”, the statement said. Among those who have signed the statement include Suresh Meha, ex-chief minister of Gujarat; Girish Patel, a senior advocate; Fr. Cedric Prakash of Prashant; Prof JS Bandukwala, a human rights activist, Vadodara; Harinesh Pandya of Janpath; Ikram Mirza of Jamate Islame Hind; Pankti Jog of Mahiti Adhikar Gujarat Pahel; Dinesh Rabari of Maldhari Vikas Sangathan, among others.